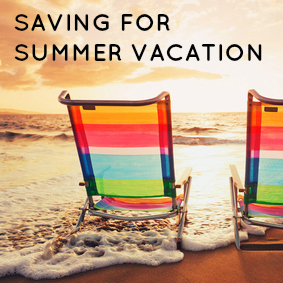 How to Start Saving for Summer Vacation – Start Now! Home / Financial Goals / How to Start Saving for Summer Vacation – Start Now! It’s a time-honored tradition: When summertime comes around, it’s time to go on vacation. However, vacations can get expensive if you aren’t careful. When I was growing up, most of our summer trips revolved around the great outdoors. With five kids, my parents weren’t too keen on flying us around. Instead, we did a lot of camping and short road trips – all relatively inexpensive vacations. However, there was one summer that we took a serious vacation: A three-week trip traveling through the midwest. That trip took serious planning, since our 15-passenger van required a great deal of gas, and there were hotels to stay at and food to buy. My parents saved up for that trip for months. As a result, I learned that the time to start saving for your summer vacation is in January or February. The first step is to estimate your costs. Will you fly? Will you drive? Where will you stay, and how much will that cost? How much will you pay for food? My parents saved on food costs by buying a five-day cooler for perishables and bringing sandwich stuff and other items for us to eat. They replenished the cooler along the way by going into town to shop at grocery stores (less expensive than buying at convenience stores). There are trip cost estimators that can help you estimate gas costs, based on your car and your route. You can save money by planning to buy your airplane tickets at certain times and by looking for discounts on hotel rooms. I also like to book airfare on Orbitz if I book in advance, since you can get a price guarantee. If the price drops lower than what you paid, you get a refund of the difference. My parents estimated their costs – and then added 15 percent to the total. That way, they could be prepared for incidentals and the reality that everything costs more than you think it will. Now you need to figure out how much time you have to save up the money. If you plan to take your vacation in July, and you start saving in February, you basically have five months to save up (going until the end of June). Take your total and divide it by five to figure out how much you need to set aside each month to get there. If your vacation is going to cost $1,000, you will need to save $200 a month to make it work. Remember that in some cases you might need to pay earlier. If you are buying airline tickets or booking hotel rooms, you might need to stagger your planning, and spend some of the money as you get it. Another strategy is to use a credit card to pay for things like airfare – since that is the most expensive thing to pay for up front for many families – and then pay off the card as you go along, hopefully paying it off before you start your vacation. If you can swing it, open a 0% APR card so that you don’t pay interest on your vacation-related purchase. If you are planning on a great summer vacation, start saving now. You’ll avoid the debt trap, and you’ll have peace of mind as you travel. Where are you going this summer? How much will it cost? Will you be able to adequately save for this vacation? Leave a comment!